Evergreen kiwi stayer Who Shot Thebarman will attempt to make it fourth time lucky when he lines-up in the A$7m Gr.1 Lexus Melbourne Cup 3200m at Flemington on Tuesday. 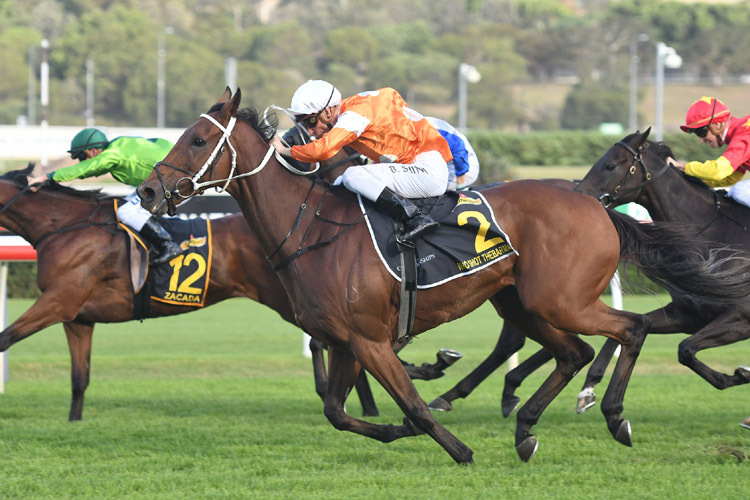 Last season’s Gr.1 Sydney Cup (3200m) winner has an enviable record in the big two-miler having placed third at his first attempt in 2014 and fifth in 2016. At an age when most horses have lost the edge to compete at the highest level, the ten-year-old Chris Waller-trained gelding continues to delight his owners, the south Wanganui based O’Leary brothers, who are keenly looking forward to Tuesday’s contest. “He really is a marvelous old horse and he is racing as well as ever,” Humphrey O’Leary said. “Typical of Chris Waller, he has the old boy peaking at just the right time. “His run for fourth in the Moonee Valley Cup at his last start was terrific and he drops another 2.5kgs from that run. Fresh from attending the annual Melbourne Cup mass on Sunday morning, O’Leary was quick to scotch any suggestion that Tuesday’s run might be the last for the A$4.58m earner. “We have had a talk about it but while he is going so well, we think there is a little more left in him,” he said. “As long as he pulls up sound then the target will be the Sydney Autumn carnival on his home patch. While O’Leary is looking forward to Tuesday he is also on a high after Ladies First, the six-year-old Dylan Thomas mare he owns with wife Fiona, performed with distinction when running fifth in Saturday’s Gr.3 Lexus Stakes (2500m). “She went a cracker and was making up good ground over the concluding stages,” he said. “This really was a dress rehearsal for next year as the 2019 Melbourne Cup is definitely a target for her. “She is going to fly home now and we will set her for the Sydney Cup in the autumn.